These Chicken Wings will fly off your plate! But that's ok, you can make more in about 40 minutes. The trick to making magnificent chicken wings in a snap is the MultiPot. Using your pressure cooker along with your oven's broiler to make perfect chicken wings for any party or gathering. 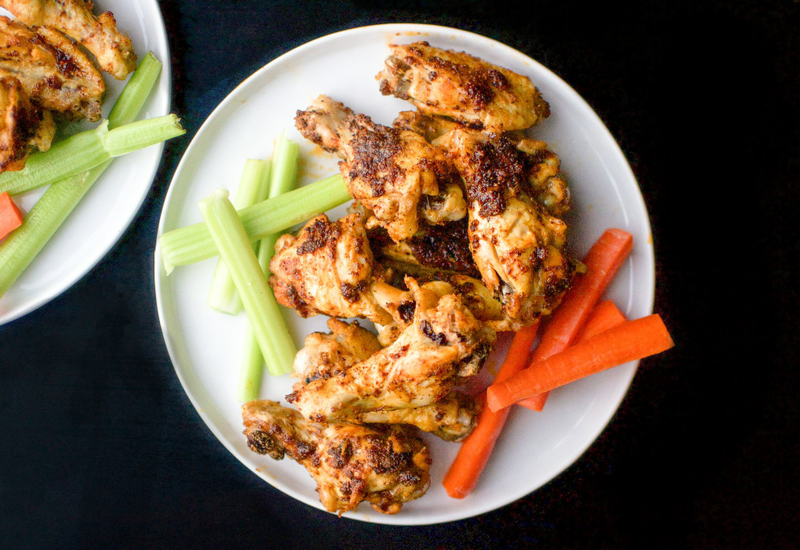 A simple blend of chili powder, garlic powder, onion powder, oregano, and cayenne pepper come together as a flavorful dry rub for chicken wings. A little bit of chicken stock keeps the wings moist and juicy while in the pressure cooker. Rub olive oil onto chicken wings to coat; season with chili powder, garlic powder, onion powder, oregano, cayenne, salt, and pepper. Place wings in the steel pot of pressure cooker. Pour chicken broth into the pot. Allow pressure to release naturally for 10 minutes, then set steam vent to Venting to quick-release remaining pressure. Arrange wings in a single layer onto a baking sheet. Cook wings under the hot broiler until the skin is crispy, 2 to 3 minutes per side. A few wacky wing facts! July 29th is National Chicken Wing Day. The world record for most wings eaten is 444 wings in 26 minutes. The average American eats 90 wings per year. Per Serving: 647 calories; 45g fat; 1.9g carbohydrates; 55g protein; 321mg cholesterol; 754mg sodium. Skipped the browning step and they were still good. The skin was definitely a little soft and soggy without the broiling but they smelled too good, everyone ate them before I could do it! Yassss! The wings were delicious. I tossed mine in buffalo sauce. It's so easy to make in the pressure cooker! I did drums and flats, and they were amazing. I really enjoyed these pressure cooker chicken wings. It's a nice switch to frying them. I definitely suggest broiling them in the oven to crisp them up. Had the boys over to watch hockey over the weekend & made these for snacking. Served with ranch for dipping. Nicely offset the spiciniess. Wish I had seen the review about broiling. That would have been a nice touch! These did not crisp up in the broiler the way I like when I make traditional wings but they weren’t bad. The spice mixture was really good. Can’t go wrong with wings, the perfect finger food and this has recipe has little cleanup. Good wings. A little heavy on the cayenne pepper. Followed the recipe exactly as written. Next time, I’ll back off on the cayenne or omit it all together. Super simple, super quick, super delicious, and super easy cleanup! Coated with a Korean style Honey Garlic sauce and the results were phenomenal. A big hit that will be played over and over again! These came out great for me. I used a pre-made rub that I like. I also used the multipot rack so that the wings were not sitting in the broth. Put the oven rack up top when broiling in case you need a reminder. 3 minutes per side to get these wings perfectly crispy. Find some small/medium sized wings. Trim a little of the fat if its excessive. But remember you aren't frying so fat isn't a bad thing. These were delicious, I don’t like my food to hot so I cut back on the cayenne pepper. I put them in the oven to crisp them and even though it took longer then 3 minutes when they were done, could not stop eating them. This will be my new go to. Next time I will try different seasonings to see how they come out. Love, love, love them. I am making the chicken noodle soup now. Love my Mealthy pot. Okay folks...I got it! Cooked recipe as stated. Wonderful! Rather than a broiler, I used my air fryer. 10 minutes at 400 degrees and they are as crisp as they had been fried. Thanks for the recipe, and hope the tip helps!